Do you have a housekeeping schedule? I used to but in the past few years it’s become more of a general routine – a very, very loose routine – than a schedule. As I’ve written here before, I’d like to develop a new routine/schedule but it hasn’t happened yet. I do, however, have a short list of tasks which I nearly always do on Mondays. I do as little as possible on Sundays, other than church and a nap, so by the time the guys go to work Monday morning, the house needs a little attention. We are all adults here so it’s not like the house is trashed but there is usually some straightening up needed, as well as a few chores I choose to do on Mondays. Well, that was *interesting*. I took a break from writing this post, went downstairs to start dinner and the power went out. We had quite a wind/rain/hail storm going on. I lit a candle, David started to take out the trash (one of the few things you can do without electricity) and his firefighter radio went off. A tornado had touched down in our area and people were trapped. He rushed out to help with the rescue while I sat in the dark and listened to the scanner. Sadly, the report is that at least one person was injured and another killed. After about an hour, our electricity came back on so I resumed dinner preparations. I then heard a commotion in our laundry room. Oh, no. Yes, there was a raccoon in there. I scared it out of there, locked the cats in and then tried to decide whether or not to see if I could remember how to load the gun. I opted to just yell outside instead. “Get on out o’ here!” No, I didn’t really say that. Well, not precisely. David is still out. I don’t know if he’s just finishing up at the scene or is one of the guys I heard out driving around looking for further damage. It’s still very windy here. 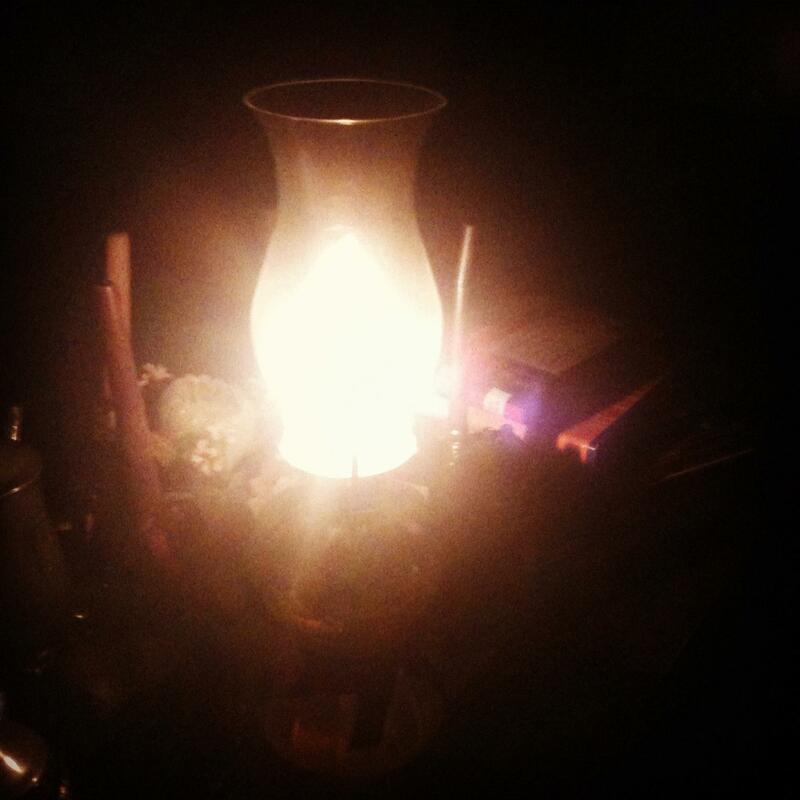 I don’t know if we’ll have anymore severe weather tonight but I’ve got my candles and hurricane lamps handy. For now, I think I’ll just leave it at that. I’ll talk about housekeeping schedules another time. So glad to know all is well at Apple Tree Farm and prayers for those hurt/injured/or lost loved one. Thanks, Terri. Oklahoma does indeed have some *interesting* weather at times.